Tlingit Tribe, circa last quarter of the 19th Century. 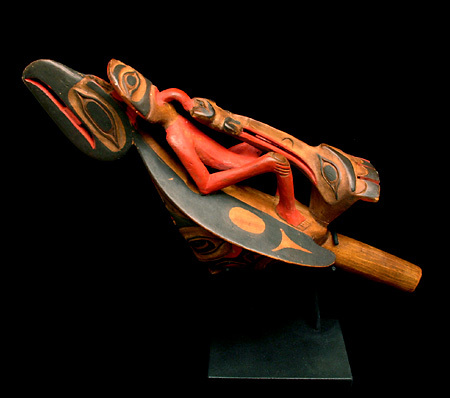 The classic chief's raven rattle depicts the human lying on the back of the raven (with openwork beak), sharing his tongue with a frog, which in turn is held in the openwork beak of a kingfisher. The underbelly of the raven is also carved and painted with the faces of a hawk and a bear, the tail serves as the handle. The details are in red and black native and trade pigments on natural wood. Provenance: Collected by Henry G. Brock of Philadelphia between 1905 and 1920, and has descended in the Brock family since that time.